We would like to say a huge thank you to Cheryl Phillips, the Store Manager at TKMaxx Carmarthen. She applied for a TKMaxx community fund grant for Cerebra and we were given a fantastic donation of £1,000! 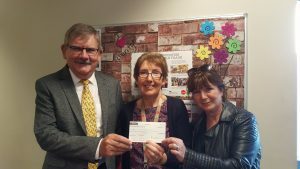 The cheque was presented to Terry Osborn, our Acting Head of Corporates, Trusts and Legacies and Amanda Tapp, one of our Fundraisers.